GRASS VALLEY, Calif. October 18, 2018 – Grass Valley Charter School students got an up close and personal look at a Reach Medical Rescue helicopter yesterday in Hennessy Park. 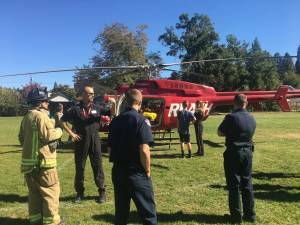 The kids got to meet Grass Valley Police officers, Grass Valley and Nevada County Consolidated firefighters – all while getting a tour of the helicopter. Firefighters and medics were at hand to answer questions and a great time was had by all.